Darling Quarter is a precinct of Darling Harbour, located in the heart of Sydney’s CBD. Alive with activity, this scenic area boasts spectacular views and is easily accessible via bus, train, ferry, monorail, lightrail, car, taxi, cycle or pedestrian access. Darling Quarter is just south of the IMAX Theatre and is easy to find. Daring Quarter is located at 1–25 Harbour Street. Take the train to Town Hall Station and exit south into Bathurst Street. A short downhill walk on Bathurst Street will take you directly to Darling Quarter, Tumbalong Park and the Sydney Visitor Centre. When you enter Darling Harbour you’ll be close to the IMAX Complex, Cockle Bay Wharf and Tumbalong Park. For buses travelling through the CBD along Elizabeth, Castlereagh, George or York streets, alight the bus at Market, Park, Druitt, Bathurst or Liverpool streets. 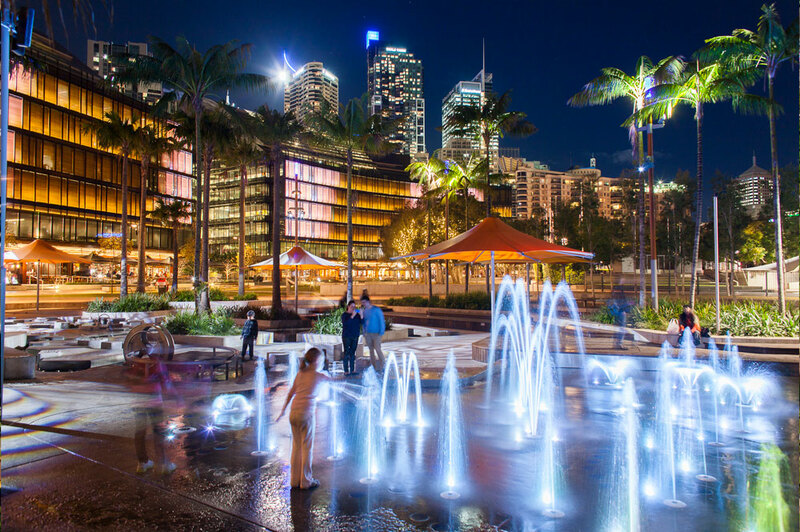 The Bathurst Street entrance into Darling Harbour takes you to Darling Quarter, Tumbalong Park and the Sydney Visitor Centre. The Liverpool Street entrance into Darling Harbour is adjacent to Darling Quarter, Tumbalong Park and the Chinese Garden. If you walk down Market Street you will enter Darling Harbour close to the Pyrmont Bridge, Sydney Aquarium and Wildlife World and Cockle Bay Wharf. Walk down Park and Druitt Streets and you will enter Darling Harbour close to Cockle Bay Wharf, the IMAX complex and the Sydney Visitor Centre. Catch a ferry to Darling Harbour and alight at King Street Wharf, or Pyrmont Bay Wharf. If you alight at King Street Wharf, you’ll be close to Sydney Aquarium, Sydney Wildlife World, Cockle Bay and King Street Wharf. If you alight at Pyrmont Bay Wharf, you’ll be close to National Maritime Museum, Harbourside and Sydney Convention Centre. The Lightrail travels between Central Station in the CBD and Lilyfield in the Inner West, stopping at a number of Darling Harbour stations. Alight at Convention or Exhibition Station for Sydney Convention and Exhibition Centre. Alight at Paddy’s Market Station for Tumbalong Park, Powerhouse Museum and Chinese Garden. Alight at Pyrmont Bay Station for Australian National Maritime Museum, Harbourside and Pyrmont Bay Park. Darling Quarter conveniently offers parking accessible from Harbour Street. Darling Harbour is easily accessible by bicycle. Several bike racks are located around the perimeter of the precinct. See Darling Harbour precinct map. Taxi ranks are positioned at Wheat Road, near the IMAX complex and Convention Place, which is behind Harbourside and adjacent to the Sydney Convention and Exhibition Centre. See getting to Darling Quarter by Taxi video below. Watch the video to see how to get to Darling Quarter by car from the west. Watch the video to see how to get to Darling Quarter by car from the east and the south. Watch the video to see how to get to Darling Quarter by car from the north. Watch the video to see how to get to Darling Quarter by Taxi.